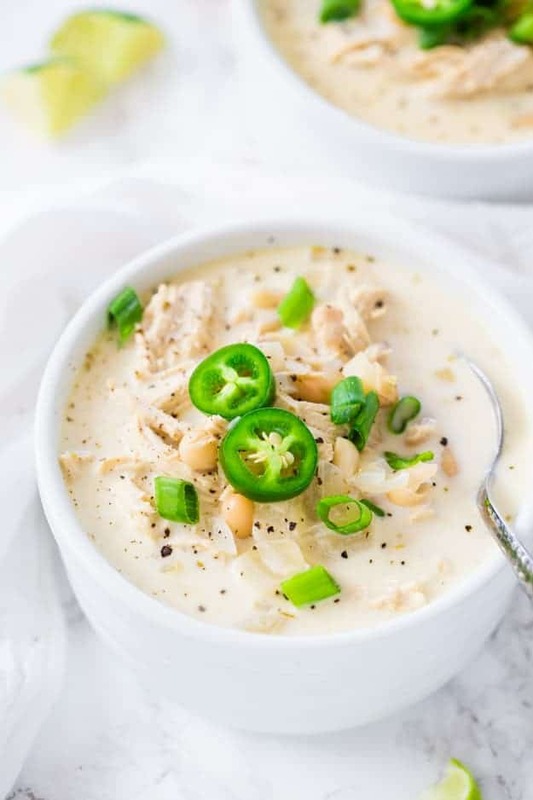 Creamy White Chicken Chili is loaded with shredded chicken, white beans, sour cream, jalapenos, and seasonings and spices. It’s so easy, hearty, filling, and the perfect cold-weather staple! Only takes 30 minutes from start to finish. 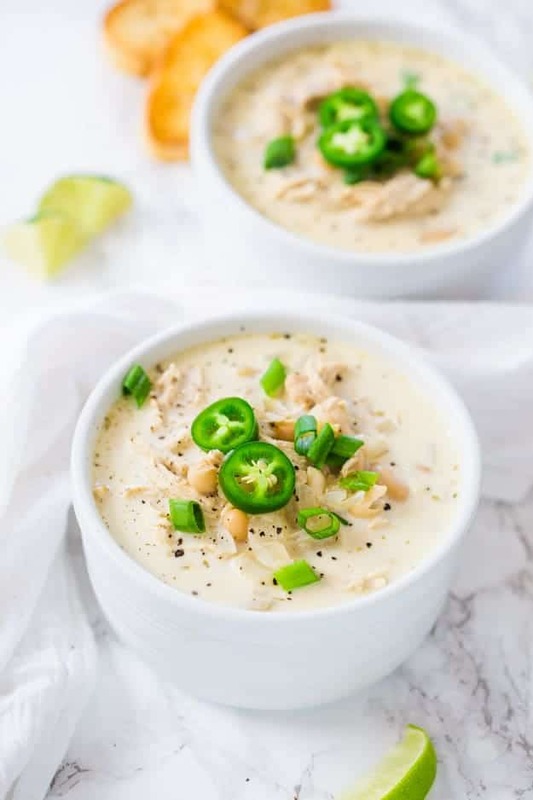 I love a delicious creamy chili, and this creamy white chicken chili does not disappoint! It’s hearty, filling with white beans, shredded chicken, with a touch of a kick with fresh jalapeno peppers. It hits every taste bud you could ever imagine. I’m serious! It’s finally starting to cool down now, and my cravings for soups, stews, and chili has started to hit. 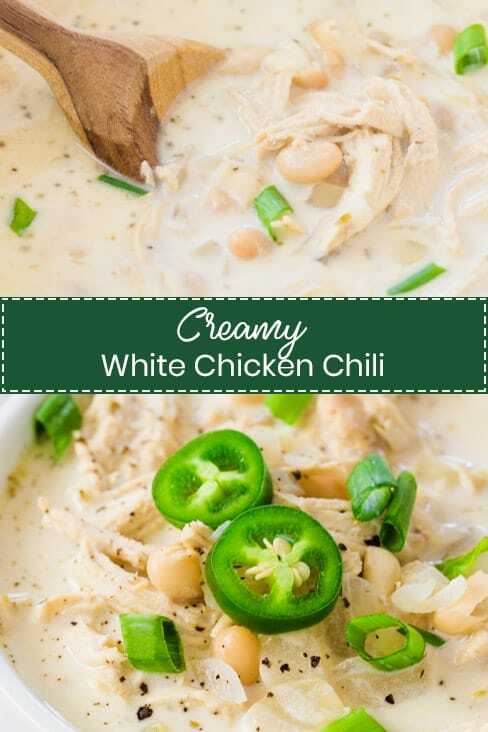 I originally posted the recipe for this creamy white chicken chili in 2016 knew I had to make it again. I also decided to update the photos, and they turned out fantastic, I think! It hit the spot, and I even froze the leftovers for when I am craving it again. Read below to find out my tips on how to freeze your white chicken chili! What goes into creamy white chicken chili? 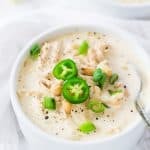 There are a few different variations in what goes into a white chicken chili, but I’ll tell you when I like to put in mine. Can I freeze white chicken chili? 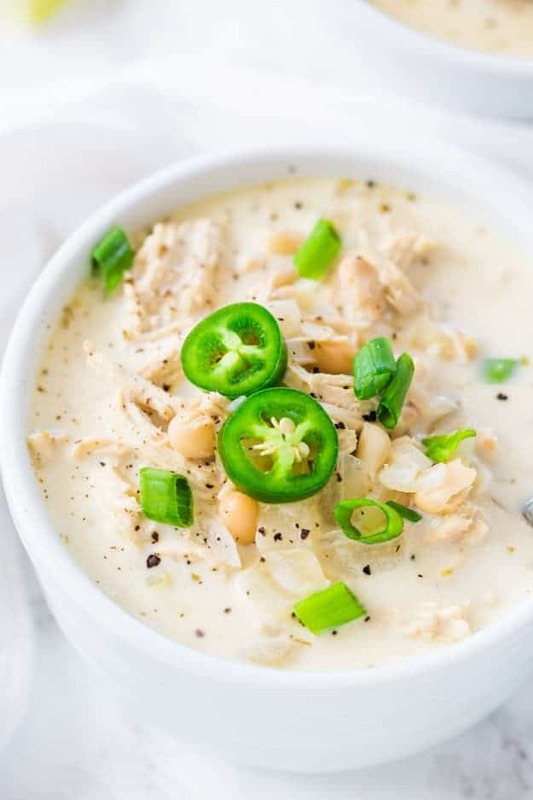 You will want to make sure your white chicken chili cools down to room temperature. I have used freezer containers and gallon-sized ziplock bags; both work great. Once it’s cooled to room temperature, I portion it out into 3-4 servings in a ziplock bag, write the date and what it is, freeze it laying flat, and once it’s frozen place it into a freezer storage container. Freezing it that way takes up less space and works perfectly for me. To thaw your chili, you will want to defrost it in your refrigerator overtop and heat it on the stovetop. Other chili recipes you may enjoy: 5-Ingredient Slow Cooker Chili Cheese Dip, Slow Cooker Vegetarian Chipotle Chili, Shredded Beef Chili, and Pumpkin Chili. 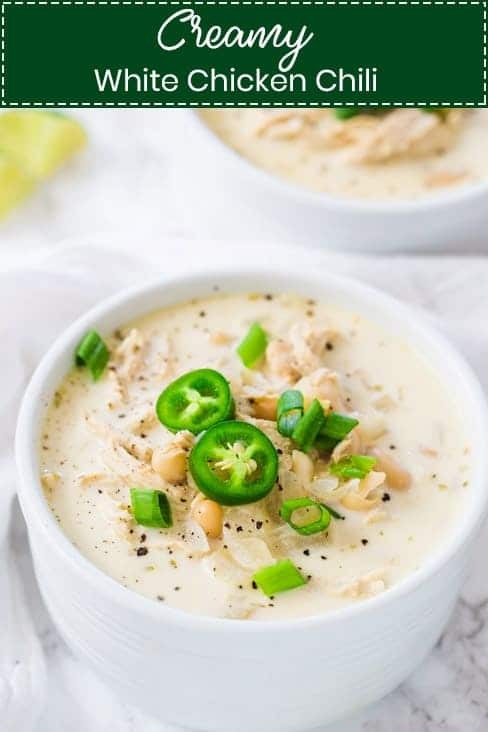 Creamy White Chicken Chili is loaded with shredded chicken, white beans, sour cream, jalapenos, and seasonings and spices. It's so easy, hearty, filling, and the perfect cold-weather staple! Only takes 30 minutes from start to finish. Preheat a dutch oven or large soup pot until warm. Place the oil and onions in the pot and saute until the onions are translucent. 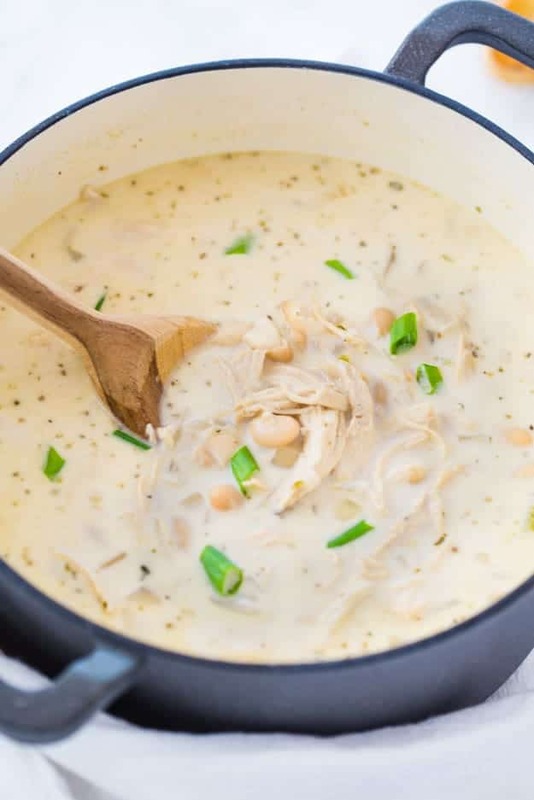 Place the garlic, chicken stock, shredded chicken, great northern beans, green chilis, jalapeno, oregano, cumin, and lime juice into the pot and mix until combined. Taste and season with salt and pepper. Bring the chili to a boil, cover and reduce the heat and simmer over medium heat for 20 minutes. Remove the lid and stir in the heavy cream and sour cream. Simmer on low for another 10 minutes. Serve with sliced green onions and sliced jalapenos (optional). Does the chicken need to be cooked first before I put it in the pot? Hi Angie! I used rotisserie shredded chicken. I would recommend cooking the chicken before adding it to the chili. Amazing recipe, and so quick to prepare! I’m a big user of rotisserie chicken. We absolutely loved this! Thank you! So happy to hear that, Joanie! We love rotisserie chicken, too, it makes dinner a breeze! I use the canned chicken breasts from the warehouse store. You can also buy cans of white chili beans, a little more flavor. Pepper Hack Cheese is great on top.